Peter Safran: Shazam’s origin story is big enough to merit its own film, and I think that’s really what everybody discovered early on, and when you see the movie you’ll see that that’s what it deserved. And that’s what it got. 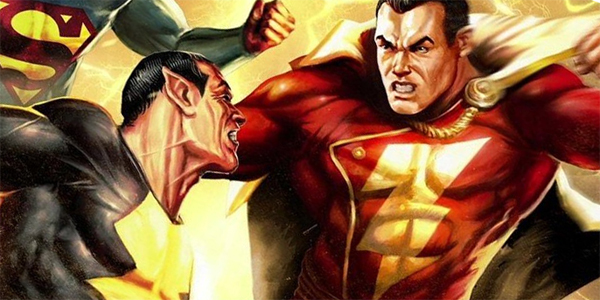 Black Adam’s presence – or, more accurately, lack thereof – was a topic instigated independent of what we got to see in the screened Shazam! footage, but it is worth noting that one of the scenes did seem to bring up the villain’s past existence in the DC Extended Universe. Specifically, the scene where the wizard Shazam (Djimon Hounsou) introduces himself to young Billy Batson (Asher Angel) includes a sparkly light show that physically plays out the history of the powers being bequeathed. The wizard says that the first attempt at choosing a hero was done long ago and recklessly, and millions were killed as a result. For those familiar with the source material, this sounds a lot like Black Adam’s history in ancient Egypt. David Sandberg: It’s a bunch of particles. Peter Safran: If you saw something… it’s like a Rorschach test. If you see that in it, you see that in it. Take from that what you will. You’ll be able to make the call for yourself when the film hits theaters in a few months. As noted by the director, Dr. Thaddeus Bodog Sivana does pre-date the existence of Black Adam, debuting in the pages of Fawcett Comics six years prior (1939 vs. 1945), but the latter has been long seen as Shazam a.k.a. Captain Marvel’s archenemy. Part of the reason for this, as suggested above, is because his powers have similar origins and capacities as Shazam’s, making most battles between them an equal fight… on paper. One serious advantage Black Adam has is simple experience, having lived for centuries with his gifts, and initially being a brave Egyptian warrior named Teth-Adam instead of a young kid who has a drive to stand up to bullies. Black Adam was created by Otto Binder and C. C. Beck, and while we’ve seen seemingly hundreds of DC villains adapted into live-action before, he’s never been depicted in the medium (which is not something that can be said of Shazam). The fact that he’s never been played by an actor before was part of the reason why Dwayne Johnson signed on for the part – in addition to being a fan of the character from childhood. In the comics Black Adam has become an anti-hero of sorts in recent years, which is clearly something that Johnson wants to pursue, but there is a certain level of expectation that he will be introduced as a villain. David Sandberg: You want to see it at some point, because it’s a classic villain. Peter Safran: He’s a perfect adversary, so one would hope that eventually you see those two on screen together – at some point. But it’s not in this one. Previous ArticleDemi Burnett Doesn’t Even Remember Submitting Herself for The BachelorNext ArticleThe Bachelor Season 23, Episode 6 Recap: Is Anybody Here for the Right Reasons?